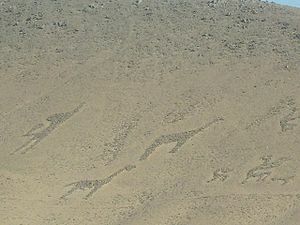 If you’ve read one of my other pages you may have read about the geoglyphs. But for those who haven’t and don’t know what they are a geoplyph is a very old drawing on the ground. These were made by ancient communities and they are dated back from 1000 to 1400 BC. This is the period of the Regional Development when the land was divided into multiple communities and there was a strong sense of cultural and social exchange. It’s believed that they are drawn or painted on the slopes of some hills to show the path from the sierra towards the coast. But it’s also believed they were used for ritual purposes. •	Geometric Families: These are people representations formed by using circles, squares, rhombuses and broken lines. •	Zoomorphic Families: These are representations of felines, birds, snakes and camel groups. •	Anthropomorphic Families: These are human representations that sometimes carry bows and arrows, crosiers and plumes. There are many of these seen here in Chile. They are found from Arica to the Loa River. These are their locations from North to south.